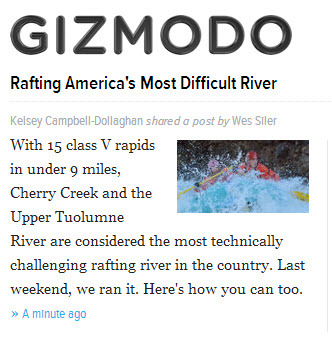 Last weekend Gizmodo’s IndefintelyWild joined us on one of our Cherry Creek trips so they could see for themselves that even with the drought this year, California is a world-class destination for whitewater rafting. Adventure travel writer Wes Siler and videographer Chris Brinlee Jr. documented their journey and produced a great piece that really does justice to what a Cherry Creek experience is all about. If you’re considering making the leap to the Creek, this article (complete with video) is a must read. Bonus: Enter To Win a Boatload! We partnered up to giveaway a fantastic prize to help us promote the great rafting season we are having this year: If you win, you get to bring a boatload of your friends on any river we run this season!